extracts juice from fruits, vegetables, wheatgrass and other leafy greens. The Samson makes Pasta and Noodles, grinds herbs and seasonings, makes baby food, minces meats, grinds coffee, and makes desserts from frozen fruit..
80 RPM, Mill-Type single gear crushes and presses, creating no heat. Makes a juice that maintains essential vitamins & minerals. Easy to use and easy to clean. Clean and reassemble in just 1 minute. Includes instruction video. It makes noodles and pasta. Try adding fresh spinach or beet juice to your homemade fetticine or spagetti. Built-in Control to prevent over-heating. Samson is made of FDA approved polycarbonate and melamine. Everything you need to know abut this wonder plant & its miracle cures. How to grow it, juice it, take it and create a total health restoration program. "Wheatgrass Juice - A Basic Guide"
The Juicer with two containers - one for juice and one for pulp. The Samson Juices Vegetables: carrots, celery, cabbage, cucumbers, beets, yams, jicama, sprouts such as kale, parsley, spinach, comfrey and more. 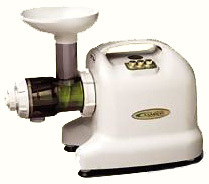 The Samson Juices a Variety of Fruits: apples, grapes, pears, melons, oranges, lemons, pineapple and more. Samson Juices Wheatgrass and other leafy greens. The pulp is very dry, producing a high yield of nutritious juice. It grinds and mixes seasonings like green onion, garlic, ginger, red pepper, radish, to create delicious, nutritious salsas. Or you can mince meats or fish. It makes delicious fruits desserts from frozen fruits. Make noodles and pasta. You can add vegetable juice to the dough. Make rice cakes (mochi), a type of glutinous rice cake using steamed rice. It grinds coffee beans. Some beans are more oily and can be ground after drying for a day.